An organization may have its number of Active Subscribers limited by a system administrator. This is the number of active subscribers this organization is authorized to have at any one time. Setting a Subscriber Limit will restrict the number of subscribers added through the User Interface, the API, and Subscriber Imports. It does not limit the number of subscribers added via Subscription Web Forms - although those subscribers will be counted in the number of active subscribers. For example, consider this scenario for an organization with a 100,000 active subscriber limit. User adds 50,000 active subscribers with Subscriber Imports. User deactivates 10,000 of those subscribers via the API. 10,000 subscribers sign up via a Subscription Web Form. User adds 50,000 more active subscribers with Subscriber Imports. The organization is now at its limit and cannot add new subscribers via the UI, API, or Subscriber Imports. The organization may continue to add users via Subscription Web Forms. You may allow an organization to exceed their visible soft limit by specifying an overage. The overage is entered as a percentage from 0% to 10,000%. Specifying a 15% overage on a 250,000 subscriber limit would allow the organization to add up to 287,500 active subscribers before the subscriber restriction is enforced. The allowed overage does not affect what the user sees nor when notifications are emailed. This setting will cause a notification to be emailed to the organization administrators when the soft limit is reached. This notification can be configured in System Configuration. A subscriber is (A) added to the organization or (B) denied being added due to the quota. The organization is over its soft limit. A notification has not been sent to the organization in the past “Hours Between Notifications” hours. See “System Configuration” below for this setting. 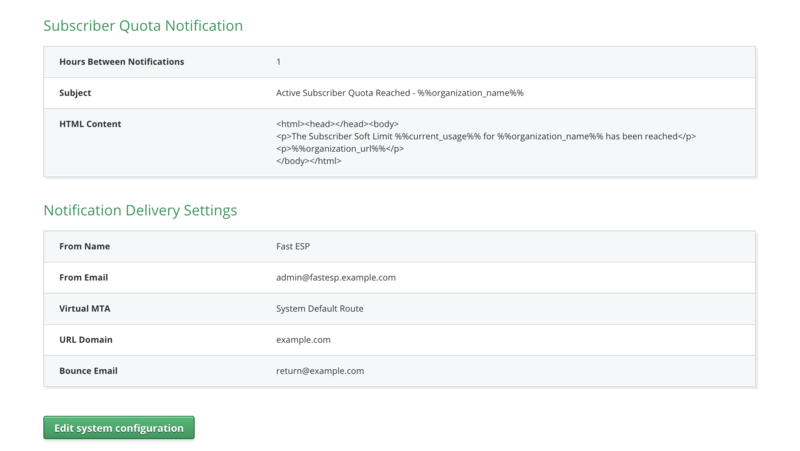 On the system configuration page, you may configure the notification email that will be sent to all administrators on an organization when their soft limit is reached. This is the minimum number of hours between notification emails. This is the content of the email notification that will be sent. There are several replacement codes available, which can be inserted via the text editor’s “Insert -> Subscriber quota” menu. These settings will determine how the notification email is delivered. Any user of an organization may view the current status of the Subscriber Quota on the organization’s page. Under “Subscriber Quota”, see the “Current Usage”. When an organization is over its soft limit, but under its hard limit, the organization is not prevented from added new subscribers in any way. They will begin to receive notifications that they are over their limit. When an organization is over its hard limit, they will continue to receive notifications. In addition, they will no longer be able to add new subscribers. On the UI and API, a validation error will be presented. On Subscriber Imports, those subscribers will be skipped and added to the “Subscribers Skipped Due to Subscriber Quota Limit Reached” aggregation. Subscribers may continue to be added via Subscription Web Forms.